How many law firms in Nigeria pay young lawyers, fresh out of law school N150,000 (One Hundred and Fifty Thousand Naira). Not many. Though compared to other industries, this is quite small but in the legal profession it is one of the best you will find. How many law firms operate with total transparency and inclusiveness, carrying all partners and staff along on the inflow and financial strength of the firm. Not many. Lawyers are more familiar with Principal Partners who wield strict financial control on the practice of the firm, who prevent their staff and lawyers from having access to clients and hide all records of financial dealings of the firm. With the continuous clamour by young lawyers for better welfare and remuneration, it is important that we celebrate the few law firms currently improving on the level of practice and law firm management. One of these law firms is Paul Usoro and Co (PUC). A firm that pays its lawyers (Post NYSC) six figure salaries. PUC is led by its Senior Partner and founder, Paul Usoro SAN. In corporate circles, Paul Usoro is variously described as the go – to – counsel for complex matters, be it litigation or commercial transactions and as the foremost communications lawyer in Nigeria, which can be seen from the position Paul Usoro SAN as held on the board of Airtel and he remains the longest serving member of the board. Not to mention that he was the founding Chairman of the Communication Committee of the Nigerian Bar Association’s Section on Business Law. Though Paul Usoro is quite reserved and hardly talks about himself. He practices law in such a way that could earn him respect from both his seniors and juniors. His Skills and prowess as a litigator and strategists are nationally and internationally acknowledged and his litigation practice cuts across all the superior courts of Nigeria. Also ranging over a number of areas, such as; election petitions, real property, criminal matters, oil and gas and commercial litigation. Mr. Usoro’s experience in Transactions is so wide and vast, that his records speak for him including the world acclaimed, first ever and all round successful Nigerian Digital Mobile Spectrum Auction conducted in 2000. A transaction, which earned the Nigerian government, US$855,000,000 for 3 Digital Mobile Licenses. 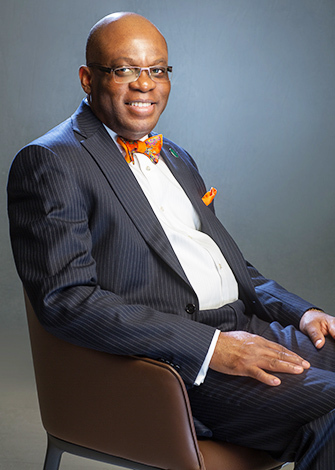 Mr. Usoro’s footprints are also stamped in the ICT world as he is an expert in the field. Mr. Usoro drafted the Nigerian Communications Act 2003, a robust and enduring piece if legislation that regulates the communications industry till date. He has also been the primary adviser to the Nigerian Communications Commission (NCC) in most of its reform initiatives till date. He served as the Legal Consultant to NCC and was the only African and Sole Legal Practitioner in the six- member Auction Control Team for the Global Systems of Mobile Communications (GSM) Spectrum License Auction that introduced Econet Wireless Networks Limited (Now Airtel), MTN Communications Limited and NITEL GSM to the Nigerian Market. It is no gain-saying that the Learned Silk is one of the most prolific members of the Bar and there is abundance of value from his professional and corporate perspective that will benefit the Nigerian Bar Association and its members.